A mother uses the best baby laundry detergent for her little one because there are special formulations made just for the baby skin. It is ideal for a skin that is pure, delicate, chaffs and loses moisture easily. These detergents are used to wash beddings, baby clothing, towels, diapers, bibs, toys, etc. These formulations take into consideration that babies put everything in their mouths. Did you know babies cannot focus their vision – they see everything as a blur. When they smile at you, they are hearing you, feeling your touch but not seeing you. Therefore, the baby senses more than it sees and it puts everything in its mouth. Considering that the mouth has 500 times more receptors than anywhere else on their skin, these detergents ensure that your baby explores safely. The conventional laundry detergents leave behind residue after washing such as fabric conditioners, the lingering perfume, etc. All these absorb through the thin delicate skin of the baby and may get inhaled. They may cause dry rashes, eye irritation and may lead to endocrine malfunctions. Some of the ingredients are also carcinogens. The conventional detergents contain synthetic detergents made from petrochemicals and phenols that are endocrine disruptors of these Bisphenol A (BPA) is notorious. The fresh fragrance is due to phthalates, and then there are the optical brighteners made from benzene which is a carcinogen. Other detergents contain bleach that releases fumes of chlorine that not only irritate the eyes and respiratory tract but is also an endocrine disrupter. To add to further damage, it also leaches into the environment causing the eutrophication of water bodies and biomagnification. These detergents also contain phosphates that break down the minerals and render the detergents more effective in their cleaning process. However, phosphates add to the eutrophication choking our water bodies of oxygen besides other ramifications. The other chemicals in the dangerous formulae are Quaternium-18, Nonylphenol Ethoxylates, 1,4-Dioxane (a carcinogen), Sodium Laurel Sulphate, Sodium Laureth Sulphate, Formaldehyde and Limonene which is an allergy trigger. Are Environmentally-safe Baby Laundry Detergents the Way To Go? Biomagnification is the increasing concentration of a pollutant in the tissues of organisms at successively higher levels in a food chain. Simply put, the planktons eat the dead plants and animals in the soil (called detritus); they are eaten in large numbers by little fishes and crustaceans. These are in turn eaten “in large numbers” by larger fishes, animals, and humans. The reason for the magnification is the organisms eaten in large numbers; it is this factor that causes the poison to accumulate in larger amounts within us. This means that the detergents that polluted us due to our persistent use of them come right back to damage us further. Thus, it is important to use environmentally safe goods that do not harm our babies. This product combines the natural cleaning power of bio-surfactants with the grapefruit seed and citrus extracts. They rinse the clothes clean and delicately without leaving any residue. This product is concentrated thrice and this means thrice the cleaning power. The extracts of Citrus and Grapefruit Seed ensure the removal of tough stains and odours. The detergent does not leave behind any hard scent or residue. This is a hypoallergenic detergent free option. It comes with an advanced and clear plant-based biodegradable cleaner. The product has a neutral pH that does not cause skin irritation or discolour the clothes. It is two times ultra-concentrated formula that is ideal for front and top-loading washers. It cleans dirt, food, stubborn stains, and other unexpected messes. It rinses thoroughly and leaves textiles softer, brighter, and clean without any residue. Not only handle baby clothes but also wools, silks, and fine washables. The plastic bottle manufacturing process must have led to CO2 and water pollution. 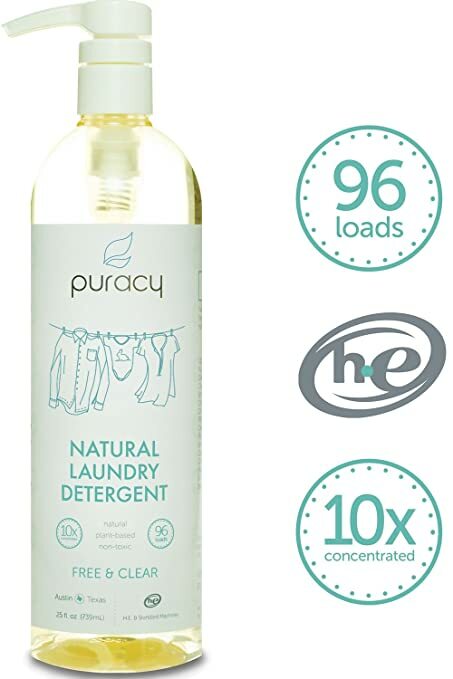 This is a hypoallergenic detergent created by the doctors and made from plants and natural minerals. These biodegradable ingredients are brought to you in 10 times the concentration to bring you the thorough and residue-free cleaning. The pump top eliminates the spilling and measuring. It can be used for microfiber towels, cloth diapers, delicate and dark clothing. 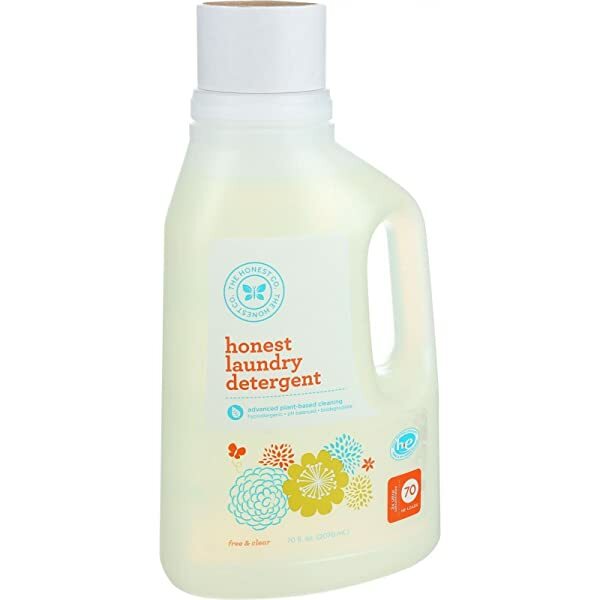 This is a triple concentrated hypoallergenic, plant-based detergent. It is perfect for a stain-fighting, antiseptic cleaning of baby clothes. The formula is approved by paediatricians and dermatologist and never tested on animals. The ingredients are water, plant based cleaners such as PotassiumCocoate, Lauramine Oxide. Propanediol as a plant-based solubilizer and stabilizer. There are other plants and mineral-based inclusions to remove soil and stains. 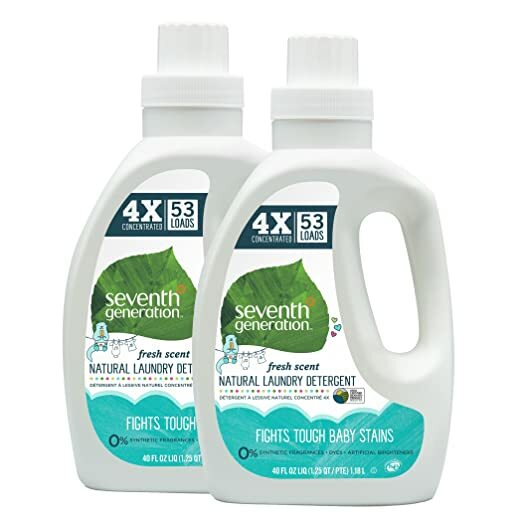 This is 4-times concentrated natural baby laundry detergent made from 100% essential oils and botanical extracts. It has a quadruple enzyme stain fighting formula for stain removal from milk and formula residue, pureed fruits, spit-up and diaper disasters. It is also effective on cloth diapers, towels, and blankets. We have shared the list of common ingredients that comprise these formulae that are deemed safe for your babies in the conclusion. 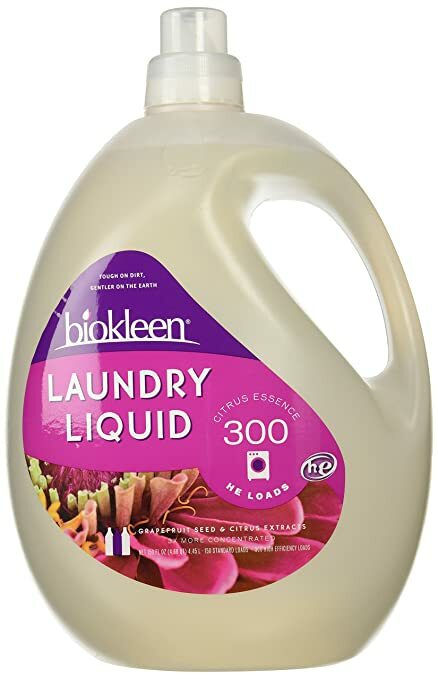 This formula is biodegradable, not tested on humans because it banks on the wisdom of the ancients who washed their clothing without the synthetic detergents. And the best baby laundry detergent is Babyganics 3X Baby Laundry Detergent as it contains nature’s goodness derived from the coconut tree. 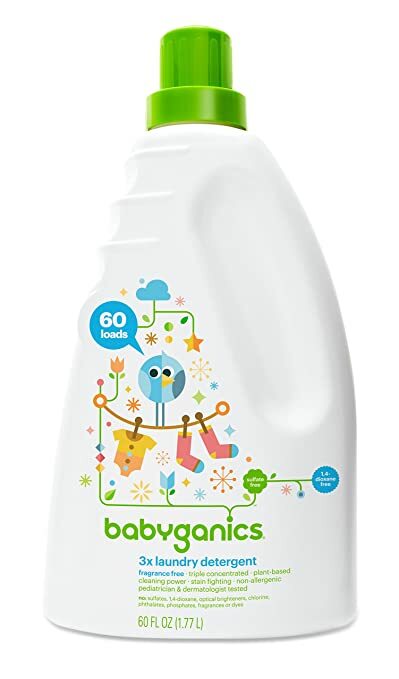 The Potassium Cocoate, Lauramine Oxide, and Lauryl or Myristyl Glucoside, these are the plant-based cleansers, thus making it especially environmentally friendly hence a better alternative for those looking for a safer baby laundry detergent. Additionally, the saponins contain plant-based soil removers such as Protease and Amylase, while the foaming agent is Oleic Acid from coconut trees. If you get hard water it is softened with Sodium Gluconate. Citric Acid and Sodium Hydroxide these adjust the pH of the water. The formula contains mineral-based enzyme stabilizers such as Sodium Tetraborate and Calcium Chloride these facilitate the cleaning action and build viscosity, making your cleaning process rather easy. Methylisothiazolinone is the preservative. So, if you are looking for the best baby laundry detergent to use, you might want, to begin with, this one.